Actisan-5L is a highly effective disinfectant to disinfect surfaces and areas that come into contact with food and beverages and the ingredients used. It can be applied, for example in the food-industry, animal care and healthcare sector. The disinfectant will battle with bacteria, molds, yeasts, algae and viruses, which makes the product particularly suitable for stables and animal transport. 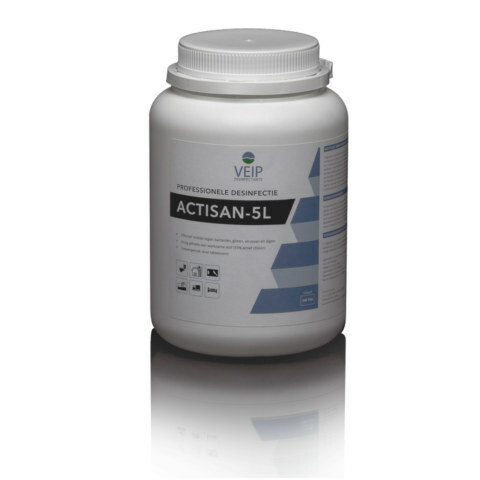 Actisan-5L is also used to eliminate microorganisms in water from therapeutic baths and private pools. Actisan-5L is composed almost exclusively of active substance. This active ingredient is very stable and therefore gives very predictable and reliable disinfection results. The disinfectant causes chemical reaction (oxidation, actually a combustion reaction) with microorganisms. Resistance is therefore not possible. The tablet form for 5 liters of water, makes Actisan-5L very easily and accurately to dose. Because of the nearly neutral pH-value, Actisan-5L for example, mist the aggressiveness of sodium hypochlorite (liquid chlorine). Moreover Actisan-5L gives in both low and high pH values, good disinfection results. Actisan-5L dissolves easily in water (maximum concentration of 20% at 15 ° C). For accurate dosing, you can view the solution chart of Actisan-5L.